The first sign of life of the Berkeley, California based band that is responsible for this release, was its name. Rather than sweeping a handful of musicians together and form a band, founder Gary Wendt had a name before even a single note had been played. Living next door to a supposedly haunted house and slowly hatching the idea of forming a band, the name was of course a no-brainer. The rest is history, although not openly shared with the rest of the world, and The Ghost Next Door was born, currently consisting of four members: guitarist/vocalist/founder Gary Wendt, guitarist Aaron Asghari, bassist Noah Whitfield and drummer Sebastien Castelain. With Gary being raised in the famous Bay Area during the heyday of that area’s metal scene it’s inevitable that particular type of metal has had its influence on his, and thus TGND’s music. That however does not mean they play Bay Area thrash or any other Bay Area type of music for that matter. In fact in my opinion TGND’s music hasn’t been affected all that much. Sure, there’s enough of it audible, igniting a bittersweet spark of nostalgia every now and then, but there’s so much more to their music that I don’t see the point in using it as a comparison or even a reference. All members have a widely oriented highly varied background music-wise and they all left their musical fingerprint in TGND’s music. Among said influences are jazz, rock, thrash and alt metal, and the guys took upon themselves the task of merging all these contrasting styles into coherent music. Perhaps a better description of their work comes from singer Gary himself: “We’re not interested in trends. A song is born from a single idea, but always mixed with some alternative sensibilities. Fusion, extreme, shoegaze, thrash we write the unexpected.” Interesting words that appoints them quite a daunting task if you ask me, but one they carried out with verve as far as I’m concerned. Proof of this is found on their second release and successor to their 2015 S/T debut, which is set to be released next week and which is entitled A Feast for the Sixth Sense. Opener Deadworld starts with a drum-backed, slow bass line introducing a song with a somewhat uneasing, doomy atmosphere. The drum lines stand out here, together with the rasping, at times raw vocals, that appear to be a seperate entity within the song, without sounding out of place or rhythm. In all honesty though, the entire song is well composed and executed. There definitely are worse ways to start an album. Fodder for the Meat Grinder has a completely different vibe, underlining the variety of influences the band allows into their music. In this song founder Gary’s roots become audible, with an unmistakable Bay Area thrash edge and ditto speed. The vocal style of the opening song, as if layered on top of the rhythm rather than embedded in it, seems to be a trend, because here too the vocals have that same effect. It’s hardly a surprise this is the same in successor Doubt as well. This allows Gary’s voice, which is rather characteristic, to fully emerge and come into its own without distracting too much from the overall song. Nicely done. Along with said vocal style, the vibe-changing feature is also something you’ll find throughout the entirety of this release. It houses plenty of surprises, some of which you’ll only discover after multiple spins. In order to fully enfold itself, this release needs to be allowed to grow on you in more than a few spins. Don’t expect raging riffs, blistering solos, full-throttle metal violence, a bone-crushing rhythm section or a neck-breaking rhythm, this release is of a completely different breed. What you get is fifty-five minutes of highly varied musical styles, carefully and subtly fused into solidly composed metal and rock songs. A strong rhythm section, where the drums attract the most attention, combined with a rather loose guitar frame where there’s plenty of room to let them howl freely form the frame. The vocal lines wrap themselves around this frame, ranging between infuriated, soothing and almost, for lack of a better word, digital (In The Sacrifice Person). 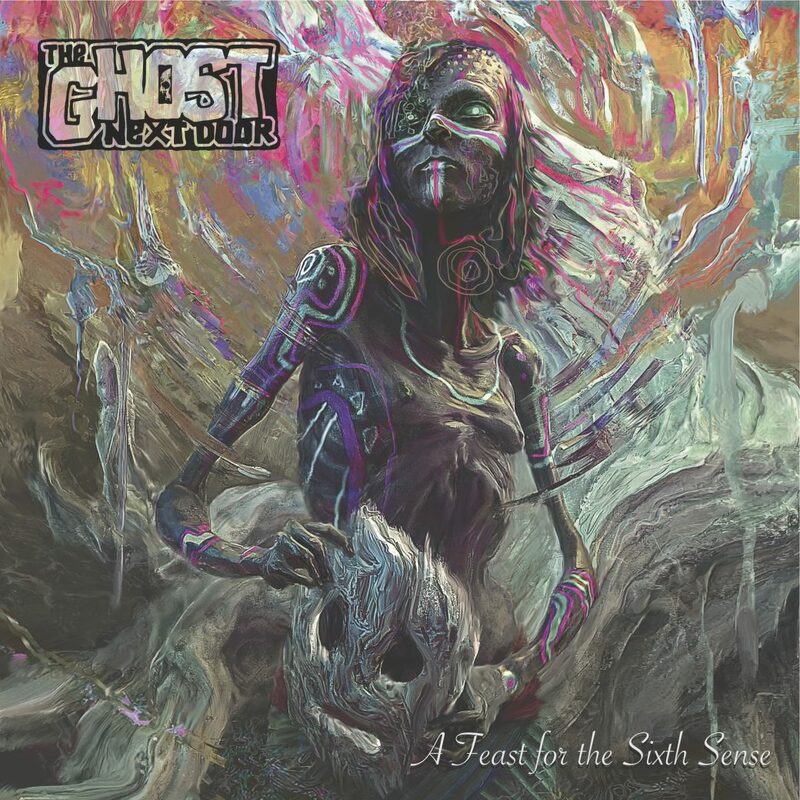 Despite this rather complicated description The Ghost Next Door’s music is very accessible and has a lot to offer to many rock and metal fans.